You are currently browsing the archives for the Democratic Culture of Corruption category. Saying that the IRRRB is corrupt is understatement. Thanks to this investigation, that corruption has gotten exposed. Which is why Layman says she is so frustrated with the agency’s recent hiring of Joe Radinovich, the unsuccessful 2018 DFL candidate for the U.S. House in Minnesota’s Eighth District. Radinovich was hired in early March to a highly-paid, permanent position that IRRR officials appear to have created specifically for him. While political appointments are not unusual in state government, and are typically temporary, the kind of job created for Radinovich, known as a “permanent classified” position, is supposed to be nonpolitical and is subject to state hiring guidelines designed to ensure a fair and competitive process in which state workers are hired on merit rather than politics. Yet an investigation by the Timberjay found substantial evidence that the IRRR’s process, in this instance, fell short of that goal, and that top agency officials sought from the beginning to offer Radinovich a plum new position, with a salary of $100,000 per year in addition to the state’s handsome benefits package. In so doing, the agency sought exemption to sharply limit the posting of the position and appeared to pass over a female candidate for the position with far more relevant experience and education than Radinovich brings to the job. Radinovich’s hiring comes on the heels of the appointment of Jason Metsa as the agency’s deputy commissioner, which is considered a political appointment and was not subject to the typical state hiring process. Metsa is an Iron Range DFLer who ran unsuccessfully for his party’s nomination for the Eighth District seat. 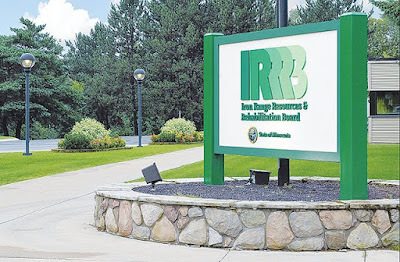 IRRR Commissioner Mark Phillips acknowledges that he sought early on to hire Radinovich at his agency and initially considered hiring the Crosby native as deputy commissioner. “It really was down to Jason or Joe to be deputy,” he said. When the job went to Metsa, Phillips began exploring options to offer Radinovich a different position. Gov. Walz, what’s your reaction to this? Will you fire Commissioner Phillips? Will you excoriate Rep. Radinovich for being that corrupt? As a former DFL state legislator, Rep. Radinovich knew civil service laws and the IRRRB. Hell, he was a member of the IRRRB board as a member of the Iron Range legislative delegation. Politically speaking, Radinovich is damaged goods now that he’s identified as gaming the system. He’s bounced around from being a DFL legislator to being the chief of staff for one of the Twin Cities mayors to running Rick Nolan’s congressional campaigns to running for Nolan’s seat before losing to Pete Stauber. At this week’s hearing, the IT commissioner said “To say that it isn’t working is not correct. It does have problems but it is producing revenue for our state.” If that’s the commissioner’s definition of working, it isn’t a definition shared by people using MNLARS. If the DFL thinks that MNLARS is working, the first question that needs to be asked is whether the people who’ve dealt with MNLARS are satisfied with MNLARS’ proficiency. I’m betting the vast majority of people would say no. In the people’s minds, the only metric that matters is whether MNLARS is quickly creates new drivers licenses with the smart chip and whether MNLARS quickly processes title transfers. If the DFL can’t proficiently process drivers licenses and title transfers, then they should be fired ASAP. Further, if this problem isn’t fixed before the end of the budget session, then the DFL, including Gov. Walz, Lt. Gov. Flanagan and Speaker Hortman, should resign. The system needs more money to bring on employees to fill holes in service, Dohman said. Part-time employees were brought on to help, but shortages still exist. It remains a question whether lawmakers will be willing to appropriate more funding to MNLARS, especially after footing the initial $93 million bill in 2017 and an additional $9 million in May. In the private sector, this project would’ve been finished a year ago and under budget. In government, they’re over their originally-anticipated budget by $100,000,000 and off on the start-up date by 14 months. Why should I think that the DFL is capable of efficiently running government? Anyone that thinks that government is efficient at delivering important services are either lying to themselves or lying to us. Predictably, neither the DFL nor the Dayton administration still hasn’t gotten MNLARS running. Now, problems are being addressed, Minnesota IT Services Commissioner Johanna Clyborne told the MNLARS Steering Committee, but progress has been slow-moving. “We still have a lot of work to do,” Clyborne said. MNLARS employees have received more than 32,000 applications for Real IDs this year and have mailed out just over a third, said Dawn Olson, Driver and Vehicle Services Director. Olson said she hopes the remainder will be mailed out by the first week in January. I’m hoping to win the lottery before the new year starts, too. Based on past history, I’m betting there’s an equal chance of me winning that lottery and DVS getting the remainder out on time. And I’m not betting on winning the lottery in the next 3 weeks. The commissioners admitted that it’s still taking more than 40 days to get drivers licenses out. Why doesn’t the state turn to a real IT company to fix the problem? At this point, the frustration level from the public is high. If the DFL doesn’t fix their MNLARS problem ASAP, there will be a political backlash. This project has already cost taxpayers $100,000,000. Here’s something else worth considering: The DFL wanted Republicans to appropriate enough money to complete the project. Republicans refused, saying they wanted to have some control over the project. That’s why Gov. Dayton vetoed the bill and the DFL voted to sustain Gov. Dayton’s veto. This MNLARS project is 100% around the DFL’s necks. Department of Public Safety Commissioner Ramona Dohman said MNLARS employees were stretched thin as they were forced to switch from one role to another to cover phones or emails or license and title applications. “Driver and Vehicle Services is able to triage to bring down turnaround times momentarily, but we just can’t get ahead,” Dohman said. In other words, DPS and DVS is no closer to fixing the problem today than they were last spring. It’s indisputable that this is a leadership failure. The only thing that’s in question is how to fix this. That’s something Democrats are terrible at. They’re great at proposing new things. Unfortunately, Democrats run into all kinds of problems in the implementation phase. Think back to MNsure and Healthcare.gov. Those were total failures, too. It isn’t surprising that people don’t trust government. A quick check of the history of government, whether it’s local, state or federal, shows how inept government is. That’s why it’s essential to elect solutions-oriented people in 2020. That’s who President Trump is. That’s the opposite of what Gov. Dayton or soon-to-be-Speaker Pelosi are. Unfortunately, I suspect that Gov.-Elect Walz will be just as inept. That’s why I’m not expecting MNLARS to get fixed anytime soon. People shouldn’t think that Jim Comey is a man of integrity. He isn’t that. Right after the election, Comey insisted that he’d only testify in an open hearing, saying that he worried about Republicans would selectively leak portions of his answers. Comey pretended to be a warrior for transparency. That doesn’t square with his gleeful evasiveness in not answering the committees’ questions. I hope that the transcript of the hearing is published soon. I suspect that lots of people want to read it to see which questions Mr. Comey didn’t answer. Let’s be clear about something important. The FBI’s political appointees aren’t men of integrity. Throughout his sham investigation, Robert Mueller has used tactics that people of integrity wouldn’t think of using. It’s time for the DOJ to stop protecting Comey and the other rats that have infiltrated, then ruined, the FBI. There’s nothing worthwhile about a law enforcement agency that has the ability to destroy its political enemies. Further, there’s nothing worthwhile about an agency that’s willing to turn a blind eye towards the FBI leadership. It’s time to dump the FBI’s leadership so the FBI can start restoring the trust it’s lost over the past 8+ years. I want to thank Congressman Issa for exposing Dir. Comey’s evasive testimony. It’s now difficult to believe that Mr. Comey is interested in transparency. It’s also impossible to think that the FBI isn’t attempting to hide lots of embarrassing pieces of information, information that’d likely show how corrupt that organization is. Comey re-asserts that he wishes Judiciary Cmte interview had been done in open session. In his USA Today op-ed, Adam Schiff proves that a little paranoia goes a long ways. His op-ed is a litany of conjectures that can’t be verified. Cohen stated in court that he made those false statements to be consistent with the president’s “political messaging,” namely Trump’s vociferous public denials of any business dealings with Russia. And in a recent sentencing memorandum, Cohen’s attorneys concede that he remained “in close and regular contact with the White House-based staff and legal counsel” to Trump in the weeks during which his false testimony to Congress was being prepared. Cohen is a proven liar. There isn’t a reason why anyone should trust anything he says unless there’s corroboration. After 2 years of investigating, that verification hasn’t been found. While it’s possible that there’s something there, the odds of finding that something seem rather slim. Now that’s an ego as big as the Grand Canyon. The only thing bigger than Mr. Schiff’s ego is his paranoia. This is an old topic. This isn’t the first time so-called intellectuals have cited a ‘hecklers veto’ in preventing Shapiro or other conservatives from appearing on campus. These intellectuals are lightweights who are frightened by the thought of defending their ideas on a substantive basis. Put in more blunt terms, these intellectuals are a bunch of sissies. What’s funniest to me is that the liberals who started the free speech movement at Berkeley would laugh at them for rejecting the opportunity to debate. Today’s progressives aren’t like yesteryear’s liberals. Can you picture Alan Dershowitz or Christopher Hitchens turning down the opportunity to debate? I can’t. TRANSLATION: We’re too stupid to figure out how to have a clash of ideas while protecting our students. That’s too complex for us. When it comes to undermining the first step in democracy, aka elections, there’s no low too low that Democrats won’t accuse Republicans of. Byron York’s article chronicles the Democrats’ Stacy Abrams’ attempt to steal the Georgia gubernatorial election. “I think that Stacey Abrams’ election is being stolen from her,” said New Jersey Democratic Sen. Cory Booker. “If Stacey Abrams doesn’t win in Georgia, they stole it,” said Ohio Democratic Sen. Sherrod Brown. “If she had a fair election, she already would have won,” said Hillary Clinton. BTW, NAN was founded in 1991 by Reverend Al Sharpton. Most Abrams supporters did not suggest that she actually won more votes than Kemp. Instead, they pointed to Georgia’s requirement that the winning candidate must receive more than 50 percent of the vote to avoid a runoff. The Abrams scenario was based on the hope that, somehow, Abrams might find an additional 17,000 or so more votes, while Kemp got no more, and then Kemp, while still substantially ahead in total votes, would have less than 50 percent of the total. If that happened, there would be a runoff with Abrams. The only problem was, the numbers weren’t anywhere close to what Abrams needed. Why let reality get in the way of undermining democracy? The Media Wing of the Democratic Party, aka Fake News, didn’t. As someone committed to accuracy, doing the required research and getting things right, I don’t have a problem labeling the Media Wing of the Democratic Party as Fake News. It isn’t like they’re searching for the truth. They’re working to further their agenda. Period. Yes, they have First Amendment rights. They just don’t have any credibility with honest people. That territory is reserved for journalists like Salena Zito, Byron York and Ed Morrissey. The US has reached a tipping point. Will we insist on honesty and principled patriotism? Or will we settle for the Democrats’ constant undermining of our system of government? I hope it’s the former. Don’t buy into the notion that the problems encountered during Florida’s recount were systemic or mechanical. That’s the conclusion I reached after I read this investigative article. I’m being charitable if I say that Broward County’s management is ineffective. I’d call them the ‘county that can’t shoot straight’ but that wouldn’t be accurate. Remember that when the Marjory Stoneman Douglas High School shooting happened in Broward County, the deputies refused to enter the building, much less confront the shooter. Think about this: 2 of the biggest stories this year happened in Broward County, FL. The Parkland shooting and the FL recount highlighted Broward County’s mismanagement. With the Parkland shooting, Sheriff Israel’s ineptitude was highlighted. With the recount, Dr. Brenda Snipes’ ineptitude was highlighted. “It became evident through the vigorous pace of counting that the machines used for the recount were starting to get stressed,” Palm Beach County Elections Supervisor Susan Bucher told reporters last week. Good riddance. As a good friend often says, “Don’t let the door hit ya where the Good Lord split ya.’ By the time the recount finished, pretty much the only people still supporting Dr. Snipes were relatives. Gov. DeSantis will pick Dr. Snipes’ replacement. I agree with Townhall.com’s Katie Pavlich that the Democrats’ smear factory, aka the Senate Judiciary Committee’s Democrats, owe Associate Justice Brett M. Kavanaugh an apology. Unfortunately, that won’t happen. It won’t happen because too many of that Committee’s Democrats have presidential ambitions. It isn’t difficult to predict that House Democrats will open another investigation into the FBI’s investigation of these charges. Jerry Nadler and Elijah Cummings can’t wait to start that investigation. Further, it isn’t difficult to predict that their investigations will produce tons more allegations but no corroborated testimony that verifies the women’s accusations. Don’t be surprised if House Democrats cause a recession in the next 16-20 months. When Pelosi was speaker the last time, she helped create a financial crisis. We didn’t get out of it until unified Republican government and President Trump’s leadership produced the current surge in economic growth.